Over the past week, Carson has shown us several new tricks. He smiles more easily and laughs frequently, he also stands up and holds his head up with parental assistance for longer and longer periods of time. In fact, he likes to be upright a lot more of the time than resting on his back. He really wants to see the world. In this video, Carson 'stands' up and flails away with his arms. Thanks to Carson, we have even more to be thankful for this year. Over the past two weeks, Carson has been visited by all three sets of his grandparents, aunts, cousins, and uncles....quite a fun, but busy stretch. Grandma Kris and Grandpa John were able to stop in for a couple days/nights during a brief business trip in Seattle. Truthfully, we can not remember too much about what happened almost two weeks ago with the whirlwind of activity around Thanksgiving, but we do know that Grandma Kris became quite territorial with Carson. Due to his work schedule, Grandpa John has been able to visit Carson more frequently than Grandma Kris and it turns out that he let her know about it a little bit. 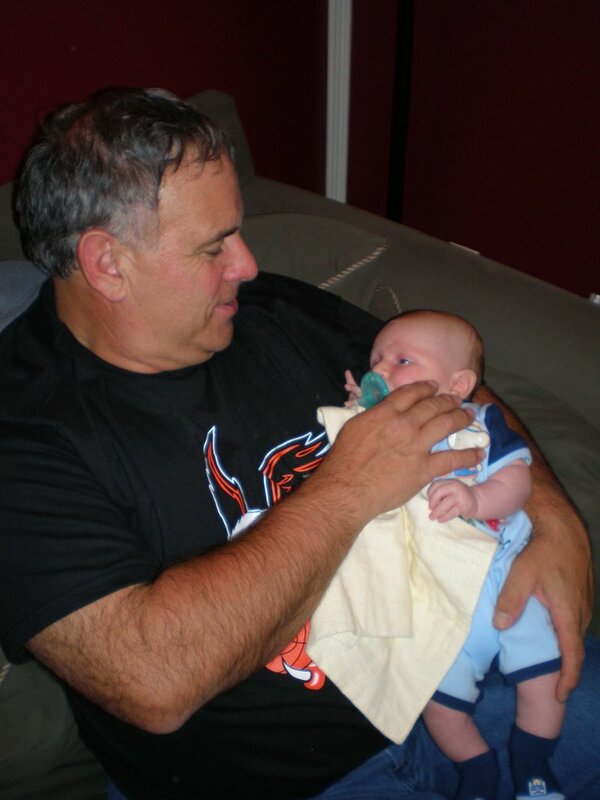 Some might say that he enjoyed some Carson holding bragging rights.....well, not anymore. 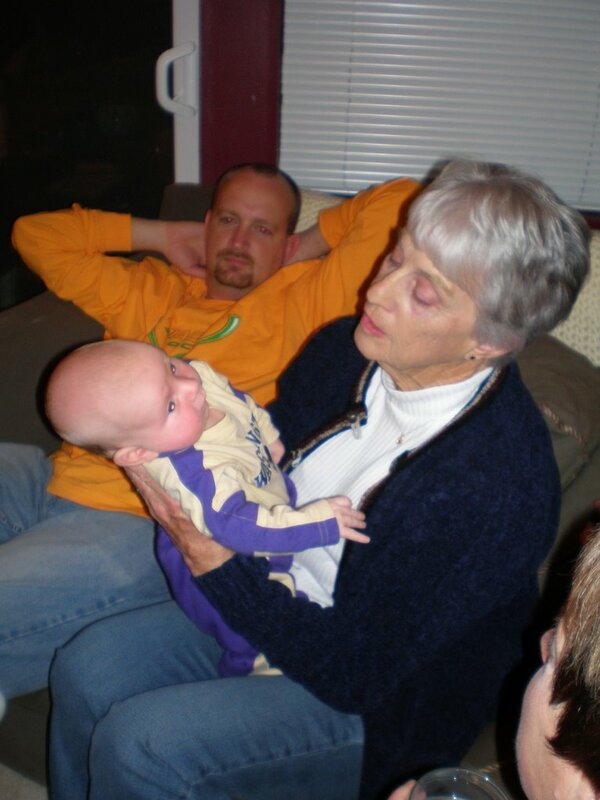 Grandma Kris evened out the baby holding score with plenty of time holding Carson during their visit. 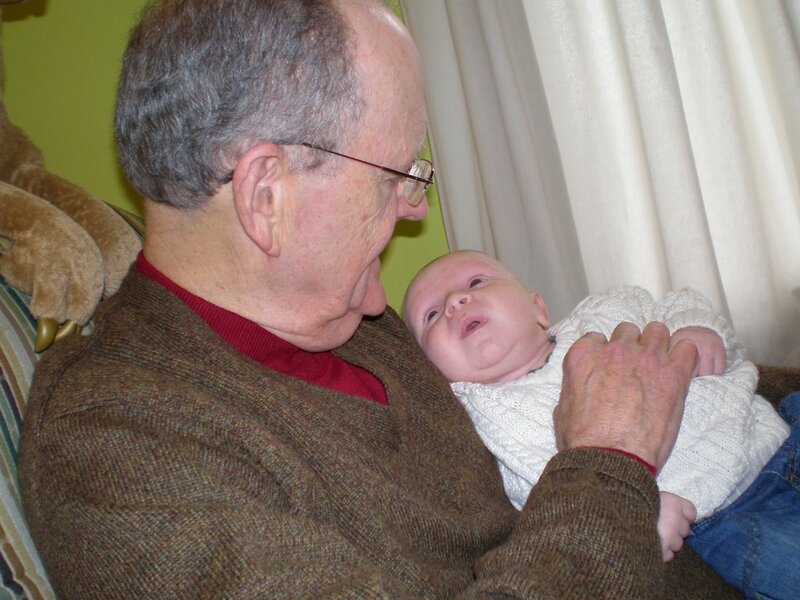 During the McKnight visit, Carson experienced yet another first when he met two of his five great grandparents. Red and Nancy joined Grandpa Wayne, Grandma Jan, and Aunt Kassie on their trek across the state. Aunt Chelsey and Santavorn joined the gathering and took turns with Carson as well. Carson displayed his super baby strength by holding up his neck for extended periods of time and attempting to roll himself over. He sure seems close to rolling over, but I imagine that he has a good bit more to go before he really does roll over. Carson now also has brand new curtains in his room thanks to Grandma Jan, he might not notice a change, but we definitely appreciate the difference the new curtains make. Grandee and Sittie flew into Seattle late Monday night and stayed until early, really early, Saturday morning. 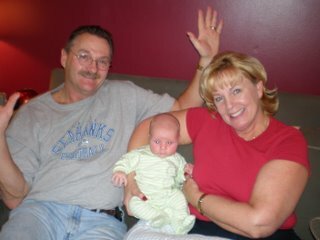 Carson met his third set of grandparents on Tuesday morning and spent the visit acting like a typical newborn. He let Grandee and Sittie hold him and find other ways to entertain him. Carson did snooze his first Thanksgiving away at Aunt Christi's house, I don't think he was awake for more than two hours over about a ten hour time period. On Friday, Carson dined out twice, once in Columbia City and once at the Ram in Kent. We are learning that you really can take a newborn out to eat, but have glimsed his one year old cousin Calder and realize that we should take advantage of this soon to be shortlived window of dining out. 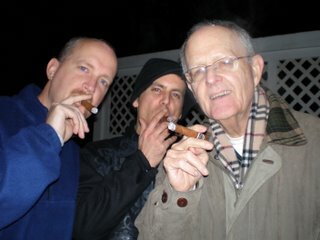 The visit was capped off with an obligatory cigar smoke by Grandee, Blake, and me in honor of yet another grandchild. 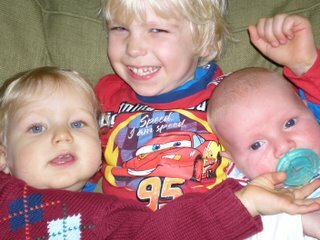 It's hard to imagine that Carson won't see Grandee and Sittie until the summer, maybe something will work out sooner, but if not we will make up for lost time with a nice long visit in June/July. This past weekend Carson had yet another first when he attended the 4th birthday of his cousin Griffin. Surprisingly, Carson showed little emotion at the party beyond the occasional cry for food and general comforting. 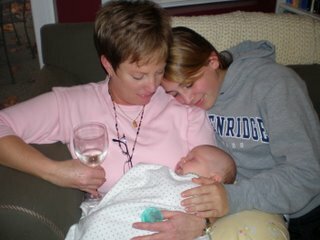 However, Trish and I realized the world of craziness that is a birthday party of 10-15 four year olds and under....wow. It sure was a lot of fun, but we are no longer just visitors in the bizarro world of parenting, we are now full fledge members. Heatlthwise, this will probably be my last post for an update besides the occasional cold and other normal health issues. Carson is just cruising along after being removed from supplemental O2 last week. It is quite a relief to feel that Carson's medical issues are behind us. He probably weighs about 13 lbs now after weighing 12 lbs and 4 oz last week. After our liberation from the O2 tube last week, Carson and his parents undertook several outings that truly brought a feeling of normalcy to our lives. On Friday, we passed time at the mall by spending some wedding gift cards that were set to expire and later that evening we dined at one of our favorite restaurants, Santorinis, while visiting George and Dina. 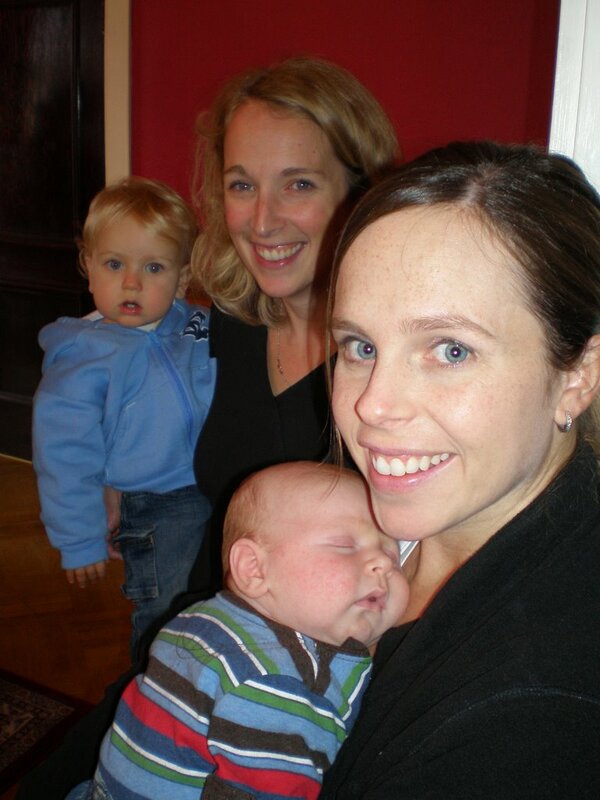 At Santorinis, we also met up with Meaghan, Jeremy, and new baby Cavan. 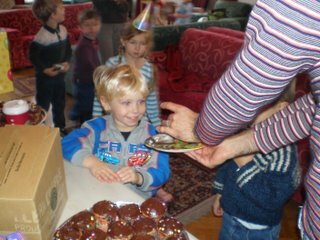 The next day we enjoyed the aforementioned birthday party of Griffin. Happy One Month Birthday Carson! Carson celebrated his one month birthday yesterday with a cranial ultrasound! How exciting for a one month old. Acually, the results that followed were exciting. Carson no longer has any evidence of a bleed/bruise in his brain and as of this morning, we took him off of his supplemental oxygen. So, the Hurt household finally has a feeling of newborn normalcy, if that is ever truly possible. Carson does have a rather strong case of baby acne and unfortunately he is not as cute as he used to be, but the fact that he no longer has tubes strapped to his face makes up for some of that. Just a quick post for today, I'll put up some new pics and random bits of info over the weekend. Carson is quite the active guy, here is a glimpse of his noises and movements. This past Monday we visited good ole Dr. Sin for a follow-up appointment. Carson continues to push the limits of waistline expansion, he weighed in at 11 lbs 11 oz, which puts him in the 97th percentile for his weight. And I am rather confident that he has now surpassed the 12 lb mark...the boy likes to eat. After a bloodtest to determine the level of phenobarb in his system, the doctor took him off phenobarb altogether because the level in his bloodstream dropped to a level that was no longer impacting him. Couple that reading with the fact that we have not seen any of the seizure like episodesthat we saw the first night and he has now been phenobard free for 4 days now! Trish and I were extremely pleased that he is no longer on the pheno, now we just have to wait for a follow-up cranial ultrasound next Wednesday and as long as that comes out fine, he will be taken off the supplemental oxygen as well. The oxygen is really only an inconvenience, but the adhesive that keeps the tubes on his face have created quite a bit of baby acne....he looks like a teen going through puberty, yuk. Like most newborns, Carson spends his day demonstrating his array of bodily functions, but it is his sleeping patterns that have drawn our attention the most over the past few nights. Carson has decided that he needs about a two-three hour transition time before he truly falls off to sleep for the night. So, we have started his bedtime around 10ish, but it's not until about 1:30 AM that he really konks out for the evening. He tricks you the entire time between 11 and 1, he falls asleep for about 10 minutes and then wakes up crying like no other time during the day. He may be experiencing little baby nightmares. Once he finally does fall asleep, he does quite well. For example, last night he slept from 1:30 to 8:30 with two feedings in the middle....not bad. 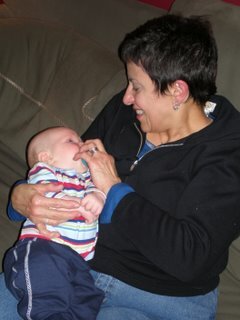 Trish and I are strategizing to see if we can move his sleep time up a little, but we are realizing that we have no control over the insurgent. I head back to work on Monday with a renewed desire to win the lottery. It's not that I don't like working, it's just that not working is more fun! Oh well, it has to be done. Trish will face the biggest adjustment as she goes through adult withdrawal, although I am not sure I always provide enough balance for her anyway. Oh yeah, make sure you get your flu shot. Carson can't get one, so people that come in contact with newborns should make sure that they have one so that we can insulate the little dude from the flu season.